The viewing card: it's become a staple part of the kit required to receive subscription channels on satellite. Now though its days are being numbered. 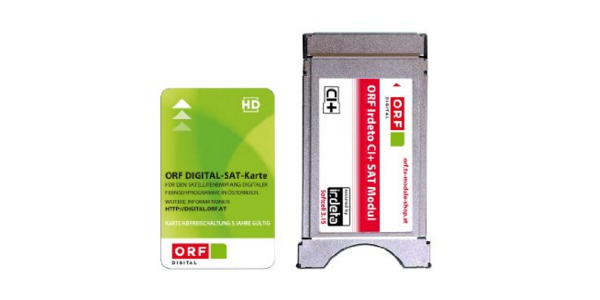 Austria's public broadcaster ORF announced last week that it was phasing out its viewing card system in favour of cardless encryption technology. ORF has said that the new and old systems will run side-by-side for nearly a decade, gradually phasing out the viewing card required to watch its channels, allowing the majority of current receivers to continue working until they become naturally obsolete. Cards will still be available to new customers until mid-2018. Cardless technology involves a CI+ module with a unique client ID that's slotted into compatible receivers. The client ID is entered online via an activation website or over the phone. Activation is restricted to users within the country and linked to details on the TV licence database. The technology, based on the Irdeto Cloaked CA product, is being adopted in a number of countries in Europe, and saves money on administering and replacing cards. Austrian TV has been forced to go down a route of encryption for similar reasons to Ireland. Both countries are dwarfed by larger countries speaking a common language. While German and UK broadcasters dominate the scene and can secure free-to-air rights for a wider area, both Austrian and Irish broadcasters must encrypt or reduce their footprint to appease broadcast rights holders - channels in both nations cannot justify getting rights clearance to broadcast free-to-air to what would be larger audiences than those available in their own countries. In the past week Nollywood Movies was broadcast free-to-air on satellite. The channel has switched from being free-to-air to being free-to-view. Free-to-view means it's encrypted for non-Sky users, but is offered for free to all viewers with a Sky viewing card. The channel lifted its encryption on 1st April allowing viewers with Freesat boxes to check out the channel, but Nollywood appears to be reverting back to subscription next month. PBS America and Al Arabiya have changed satellite transponders on the Astra 2 satellite cluster. PBS America is available on Sky and Freesat, while Al Arabiya is on Sky only, but is available as free-to-air channel in "non-Freesat mode" on Freesat receivers. Freesat viewers that have lost PBS America should reboot their satellite receiver, or if all else fails do a rescan. Most receivers should handle the change automatically.